Meet your Shanghai local guide and driver at the airport, and then transfer to the hotel. Remainder of the day is on your own arrangement. 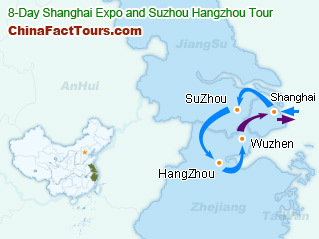 After breakfast, drive about 1.5hrs to Suzhou to visit the Tiger Hill, Suzhou No. 1 Silk Factory and the Master of the Nets Garden. Transfer to Hangzhou. 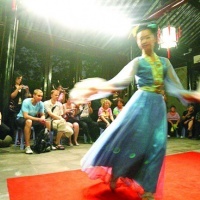 Cruise on the West Lake and then visit the Hefang Street. 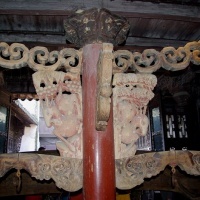 In the morning visit the Lingyin Temple and the Peak that Flying from Afar. After lunch visit the Longjing Tea Plantation to touch Chinese tea culture. 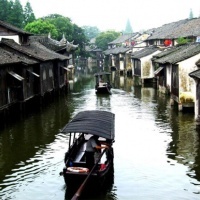 After breakfast, we will drive to the ancient Water Town - Wuzhen to visit the Southern China Hundred Beds Museum, Flower-Printed Blue Cloth Workshop, Southern China Woodcarving Exhibition Hall, Pawns Museum, Yu Liuliang Money Hall, and enjoy a Shadow Play. Drive back to Shanghai. After breakfast, visit the Jade Buddha Temple. Then walk along the Bund and visit Nanjing Road. After lunch, visit Yu Garden and Yuyuan Market. In the evening, have a walk on the French Concession bar street. 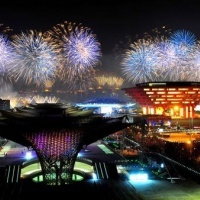 Full day tour for 2010 Shanghai EXPO site. Note: Standard day ticket holders can enter the Expo area once on any day except for peak days. (Standar day:from May 1 to Oct 31, 2010, excluding May 1 to 3, October 1 to 7 and October 25 to 31). Be picked up to the airport for your homeward flight.